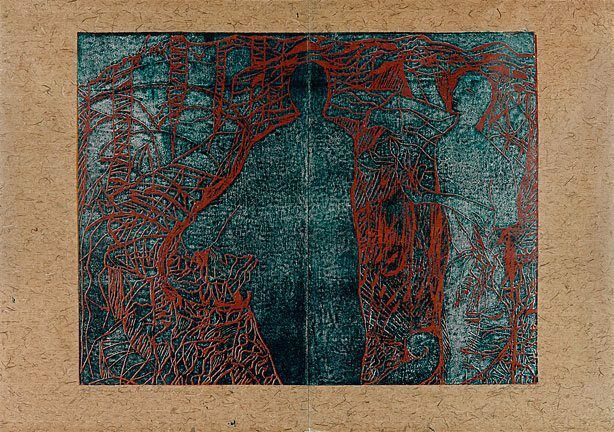 This woodcut emanated from 20 years' repeated use of the forest as my imagery. I wanted to do large works to take the woodcut out of an illustrative or limited medium into a large-scale concept like a painting yet with all the vigour of the cutting which I love. I cut the blocks after drawing a charcoal image and the cutting is dominant in the final image, the printing is towards this. I think my interest in Asian art had some component. Signed and dated l.r., pencil "Ruth Burgess '95". Author Unknown, Ruth Burgess woodcuts , 1995, cover (illus. ).